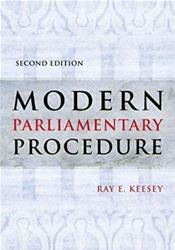 In 1971, Ray Keesey developed a guidebook that revolutionized parliamentary procedure. By eliminating misleading terminology and simplifying many of the complex and overly technical aspects of the traditional parliamentary process, Keesey.s book offered clear rules of order for efficient democratic action in deliberative meetings. Thanks to its accessibility and lack of jargon, the Keesey System has become widely used by large deliberative bodies and small associations alike, allowing readers to quickly comprehend and implement the rules without needing to be experts on parliamentary process.